Monday, Feb. 6, 4-6 p.m.
“A Feast of Words,” the annual literary celebration that recognizes Emory faculty authors and editors of books published in the last year, will be Monday, Feb. 6. Hosted by the Center for Faculty Development and Excellence (CFDE), Emory Libraries and Information Technology and the Emory University Bookstore, and sponsored by the AJC-Decatur Book Festival, the event will take place from 4 to 6 p.m. in the Jones Room of the Woodruff Library. 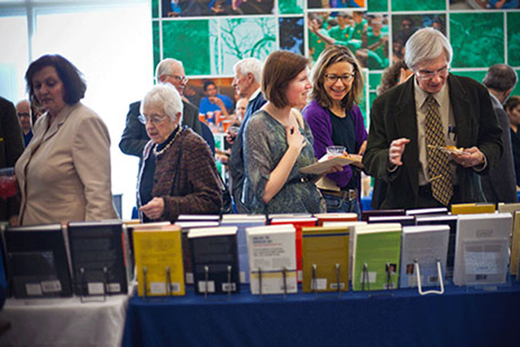 This year, 113 Emory faculty authors and volume editors representing a rich diversity of scholarship will be celebrated at the event, which is considered an opportunity to celebrate the university's talented intellectual community. A dozen of the recognized faculty members are listed more than once, credited with multiple titles published in the last year, notes Allison Adams, CFDE associate director. A full list of the names of authors and editors will be released at the celebration. Emory College of Arts and Sciences faculty members are represented 57 times. Emory School of Medicine faculty members are represented 28 times. Emory School of Law faculty members are represented 16 times. Candler School of Theology faculty members are represented 12 times. Oxford College and Rollins School of Public Health faculty members are represented six times each. Goizueta Business School faculty members are included three times. Nell Hodgson Woodruff School of Nursing faculty members and Campus Life staff are each represented once. The Laney Graduate School is represented for its role in the publication of “The Letters of Samuel Beckett, 1966-1989,” the fourth and final volume in the series. Emeriti faculty members are represented nine times. "Never Better! The Modern Jewish Picaresque," by Miriam Udel, associate professor of Yiddish language, literature and culture in both the Department of German Studies and the Tam Institute of Jewish Studies, won the National Jewish Book Award for Modern Jewish Thought and Experience. "White Rage: The Unspoken Truth of Our Racial Divide" by Carol Anderson, Charles Howard Candler Professor of African American Studies, has been short-listed for a National Book Award. "Poverty in the United States: Women's Voices," by Paula Frew, assistant professor in both the Department of Behavioral Sciences and Health Education and Emory School of Medicine’s Division of Infectious Diseases. "Pastoral Care: Telling the Stories of Our Lives," by Karen Scheib, associate professor of pastoral care and counseling at Candler School of Theology. "Provincial Soldiers and Imperial Instability in the Histories of Tacitus," by Jonathan Master, associate professor in Emory College’s Department of Classics. "A Feast of Words," which traditionally kicks off Emory’s Founders Week, will feature remarks and a toast from Interim Provost Stuart Zola. Wine and hors d'oeuvres will be served. Those planning to attend are encouraged to register in advance.